Huawei’s latest Honor View 20 offers an unorthodox colour scheme and all-screen front for a whole new look. As the first phone to offer a ‘hole-punch’ notch – a small hole in the top left-hand corner of the display which the selfie camera pokes through, the device is able to utilise full viewing of its large, FHD+ LCD 6.4” screen. 28 grams lighter than the iPhone XS Max, the View 20 provides a relatively light option without compromising on display size. Though lacking wireless charging, the View 10 is one of the fastest charging phones available with a 30 minute charge providing you with 60% of battery from 0. 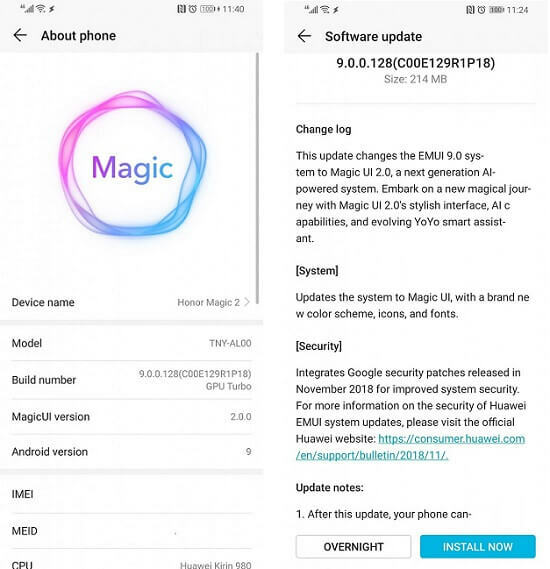 ‘Magic UI 2’ is the Honor’s take on the latest version of Android – 9 Pie. You’ll be able to choose from the traditional three-button navigation keys or a joystick-like navigation dock and gesture navigation. Out of the box, the View 20 features icons for every app on the homescreen, somewhat similar to Apple’s iOS. There is an option to enable the more traditional Android app drawer, though it comes with an button rather than the swiping gesture. Most notably, Magic UI 2 has added power-saving features that can extend battery life dramatically if needed. Featuring 2D face unlock, this feature may be lacking the same security provided by 3D face recognition, as featured on the latest iPhone devices. Where the View 20 may lack in facial recognition, is made up by the camera. Featuring a new 48 mega-pixel camera, one of the first on the market, paired with a secondary sensor, the View 20 can capture richly detailed shots. With prices starting at just £500, the Honor View 20 offers considerable features for a far lower price tag than competitors offering similar specs, including Samsung, Google and Apple.